The next generation of innovators are ready to make a difference in the world, and Accenture’s Innovation Challenge is providing a platform of inspiration. 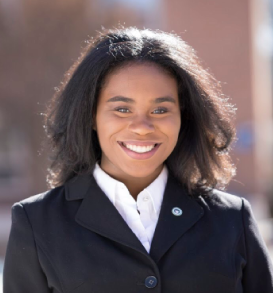 I was selected as the only freshman to join the Howard University team, and I found my calling—a career in consulting. And it was all thanks to a little bit of kindness. Teams of undergrads and MBA students from leading universities across the U.S. compete in the challenge each year, putting their heads together to dream up innovative solutions to real-world challenges faced by nonprofit organizations. Teams from 50 schools competed in the first round of this year’s challenge, developing a solution for CARE USA, a nonprofit group that focuses on nearly 1,000 life-saving initiatives to better the lives of more than 80 million people across the globe. In the second, “virtual” round, a panel of Accenture judges will narrow 14 teams down to the top four, who will be invited to compete in the final round in Atlanta, GA, April 13. The winning team receives a cash prize, Accenture summer internship offers—and hands-on experience to inspire their careers for a lifetime. When career fair season rolled around, I was taught to be intentional about the companies I wanted to target. Fascinated by the consulting industry since attending a resume workshop led by Accenture, that’s where I decided to focus my research. I was deep in thought when I saw three people struggling with some boxes outside of the fair, but I stopped to ask if they needed help. Imagine my surprise when it turned out to be, out of 150 companies, the recruiters from Accenture. You can imagine how happy I was when I was invited to apply to the Accenture Innovation Challenge. From 8 a.m. to 5 p.m., we were consultants at Accenture during the Innovation Challenge. We networked and worked the entire day to create a solution that CARE could use for the issue they presented to us. These hours would be dedicated to problem-solving, innovative approaches and effective presentation and communication building. We implemented skills and knowledge from work experience, classes and what we learned from our coach—all while keeping Accenture’s values, like the concept of design-thinking, integral to our solution. Despite any hesitations we had along the way, at the end of the day, we closed our presentation with confidence! In the end, we didn’t win, but I walked away with an invaluable experience. It was an honor to get so close to the industry I aspire to join upon graduation. I am incredibly thankful to have had the opportunity to learn more about the industry, as well as to gain new friends along the way. The (innovation) challenge was accepted, and I will be challenging myself every day to continue to propel myself toward a career in consulting. The Innovation Challenge is just one of many ways Accenture is inspiring students—personally and professionally—across the globe. See when we are visiting campuses in your area. Ready to jump-start your career? Bring your whole self to work and do work that matters when you join the Accenture team.